The mission of the Boardman River Guide (BRG) is to share useful information with visitors & local residents about the many recreation opportunities along the beautiful Boardman River in Grand Traverse County, Michigan. The Boardman River is a natural resource owned by the public, but there is no "Official" website (including this one) that provides information about all of the nearby recreation; instead, it is spread out over numerous websites, often with inaccurate or outdated details. The BRG incorporates info from many sources in addition to providing numerous details that previously didn't exist on the internet. The BRG is maintained by a born-and-raised Michigander who has chosen to call Grand Traverse County 'Home' for nearly 30 years. I'm not an expert or professional anything, nor do I have any affiliation with organizations referenced on the map or this site. The BRG is simply a labor of love, born of a desire to help others safely experience the natural beauty of our river valley and created using knowledge gained over 25+ years of exploring the river, its banks & tributaries with children, grandchildren, friends and family. I hope you find it useful. View the Boardman River Recreation Map. Follow the Boardman River on Facebook, Instagram & Twitter! Explore more Traverse City Trails & Campgrounds! DISCLAIMER: Every effort is made to provide current & accurate information, however, it is for reference only & NOT guaranteed. Please follow the appropriate links to learn detailed information & current conditions. Please note that websites can and do change links often; thank you for reporting broken links. Questions and comments are always welcome. The Hacky Turtles "Take Me There" to Traverse City! 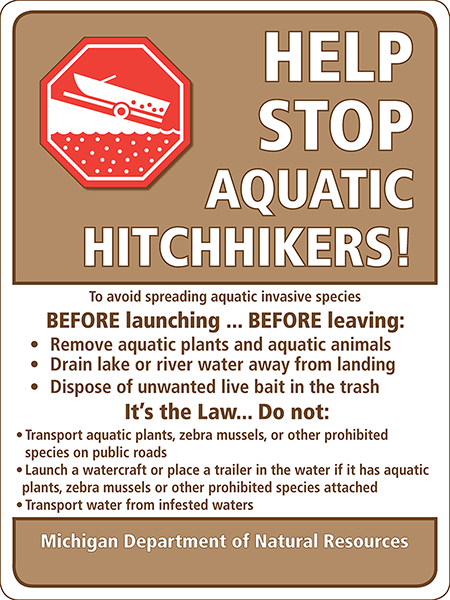 Please help STOP invasive species! Barrier-Free Access Boardman Lake Campgrounds Camping Cycling Hiking Keystone Rapids Launch Sites Lower Boardman Middle Boardman Paddling Trails Tubing Upper Boardman WARNING! Sabin Dam is located on Cass Rd behind the Boardman River Nature Center , less than 5 miles from downtown Traverse City. .....go with the flow, immerse yourself in nature, slow down and meander, go around the obstacles, be thoughtful of those downstream, stay current; remember, the beauty is in the journey! All original photographs & text Copyright © 2017 @TheBoardman. Awesome Inc. theme. Powered by Blogger.